Eminent Technology LFT-16 loudspeaker from Eminent Technology, Inc.
Hi-Fi Speakers > Eminent Technology LFT-16 > Eminent Technology, Inc. The LFT-16 is Eminent Technology?s first hybrid bookshelf size speaker system using the highly acclaimed Linear Field Transducers combined with a 6.5? woofer in a low Q sealed enclosure. 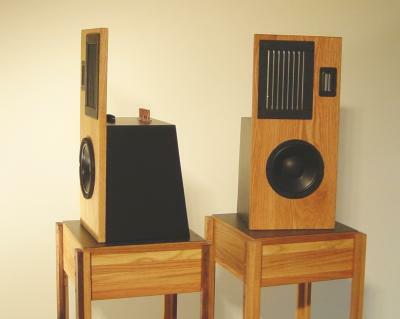 The magnetic drive principle developed by Eminent Technology for the LFT speaker series is unique to the industry. As the diaphragm of the speaker moves between the magnets following an audio signal, the magnetic field intensity remains constant. In a sense it is the magnetic equivalent of a push-pull electrostatic loudspeaker, differing in that it requires no step up transformer or bias voltage and that the audio signal is applied directly to the diaphragm. As a result, distortion remains low even at high sound pressure levels. Eminent Technology LFT-16 > Eminent Technology, Inc.